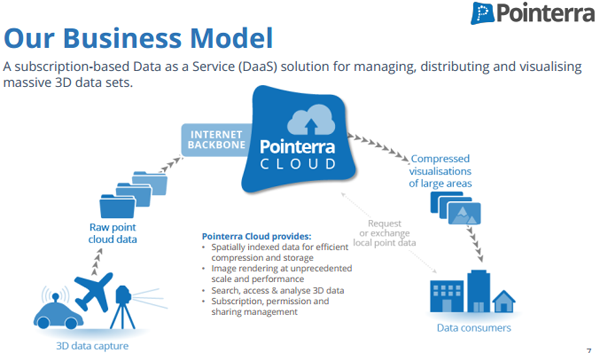 All the planets are aligning for 3D geospatial data technology group Pointerra (ASX: 3DP) with important information coming to hand on Wednesday regarding technical and commercial milestones, progress with sales, important management appointments and robust support from existing shareholders. 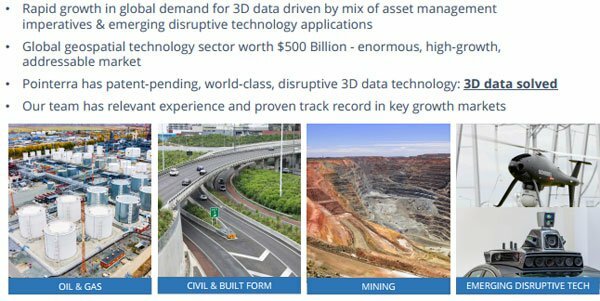 With regard to technical and commercial milestones, 3DP has achieved a significant commercial milestone, with the release of a commercially saleable solution containing at least 100 billion points of 3D data. This provides confirmation that the company’s world class technology has successfully passed the Class A Performance Share milestone hurdle, which as we discuss later is significant in terms of the conversion of Performance Shares into ordinary shares. Through a combination of 3DP’s proprietary storage and visualisation technology and the massively scalable AWS cloud computing environment, the achievement of this milestone has allowed the company to begin scaling its Data as a Service (DaaS) offering to trial and paying customers. This will also assist in attracting technology licensing opportunities with leading geospatial sector players such as the recently announced Memorandum of Understanding with AAM Group. Of course, it is early stages with regards to this MoU and outcomes are yet to be determined, so investors should seek professional financial advice if considering this stock for your portfolio. Exceptional technical progress made by 3DP, along with the establishment of valuable partnerships and the ever-changing dynamics within the core industry now sees trial users, paying customers, enterprise partners (and their customers) and technology licensing partners being able to rely on the company’s world first technology to deliver actionable 3D information to support a diverse range of digital asset management solutions. As a result of these developments, 3DP is now poised to scale this capability to a global marketplace, and recent momentum has grown the group’s sales pipeline of DaaS trial and fee paying customers across multiple continents, necessitating the recruitment of additional sales resources to further grow the sales pipeline and turn trial users into full monthly recurring DaaS subscription customers. As income from this source gains traction, in particular the level of recurring income, investors are likely to be attracted to 3DP’s business model due to its revenue visibility and performance predictability. With an increasing focus on sales growth, 3DP announced that Non-Executive Director, Graham Griffiths will assume the role of Non-Executive Chairman effective July 1, 2017. The management restructure reflects the group’s evolution from a technology development company to a globally focused sales business, focused on leveraging the decades of international technology sales experience that Griffiths brings to the table. 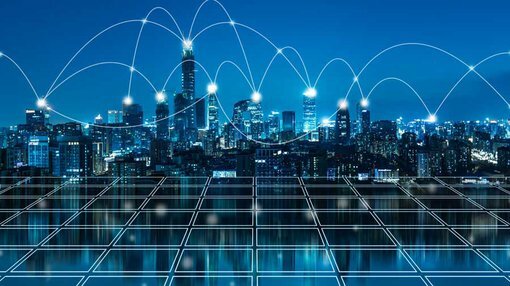 In commenting on this development, Griffiths said, “Pointerra is at a pivotal point in its development, having established itself as a technology leader globally in a growth market with foundation indirect channel and technology partnerships in place and more under development”. Griffiths highlighted that the customer value proposition is clear with the group having a proven technology leadership position to address the global market opportunity and a substantial sales pipeline. Having reached the commercial and technical milestones previously mentioned, the automatic conversion of 45 million Class A Performance Shares into ordinary shares has been triggered. Importantly, the holders of approximately 52 million 12 month escrowed vendor ordinary shares and just over 120 million 12 month escrowed vendor class A, B and C Performance Shares have also voluntarily extended their escrow terms for a further 12 months commencing June 20, 2017. This is clearly a vote of confidence in the company’s future, and importantly aligns management’s and major stakeholder’s interests with retail shareholders, a factor that has without doubt played a significant part in today’s substantial share price rerating. 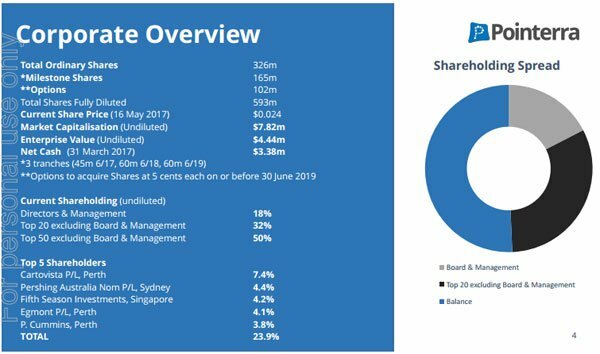 The importance of this development is evident when examining the company’s shareholder distribution (see below) prior to the exercise of Performance Shares. Also note management’s substantial financial stake in the company.